Walt Disney Animation Studios presents Frozen, based on The Snow Queen by Hans Christian Andersen. Runtime: 108 minutes. The royal family of the fictional Scandinavian Kingdom of Arendelle has two daughters: blonde crown princess Elsa (Idina Menzel) and redhead Anna (Kristen Bell). After a childhood incident in which Elsa—born with significant powers of cryomancy—seriously injures Anna, the King and Queen separate the two in order to protect them both: Anna from recalling Elsa’s powers and Elsa from becoming afraid of her own powers. Even after the King and Queen are lost at sea, Elsa—too afraid of hurting anyone with her powers—continues the separation despite Anna’s pleas until the day of Elsa’s coronation. At the summer coronation reception, Elsa is aloof from her sister and tries to keep to herself until her sister falls in love with Prince Hans (Santino Fontana) and declares her intent to marry him. Elsa, pointing out the absurdity of the notion, accidentally reveals her cryomancy before all the courtiers and flees the kingdom, unintentionally setting the entire kingdom into a premature endless winter. With the queen gone, Anna sets off to find her in the hopes of reconciling her sister and ending the early winter. 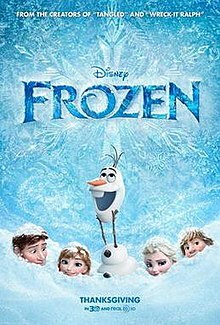 Along the way she is aided by Kristoff (Jonathan Groff), his reindeer Sven, and animate snowman Olaf (Josh Gad channeling the spirit of John Leguizamo). Unbeknownst to either girl, they have to deal with the Duke of Weselton’s (Alan Tudyk in a role recalling Wreck-It Ralph) conspiracy to have Elsa killed and Arendelle subjugated to unfavorable trade conditions with Weselton.